Inspired Whims: Inspired Whims' Birthday Give-Away! H-A-P-P-Y B-I-R-T-H-D-A-Y to you! H-A-P-P-Y B-I-R-T-H-D-A-Y to you! Yes friends, a year ago this upcoming Saturday (22 Sep) Inspired Whims was born - and boy have we come a long way since then! It's been such a joy to have this little creative outlet that has blessed me, and hopefully blessed you, in so many ways. I couldn't have made it this far without YOU - my dedicated readers, participants, and friends, who have made the commitment to blog totally worth it. THANK YOU!!! In order to celebrate this (very) happy birthday, we'll have a gift card giveaway next Monday (24 Sep). Because I have two gift cards to give away - $25 to Marshall's and $25 to Michael's - there will be two lucky winners selected at random by way of random.org. 5. Leave a comment below telling me your favorite type of post - Design and Decor, Recipes, DIY, Travel, etc. 6. Leave a comment below telling me your all-time favorite post. 7. Leave a comment below telling me which post has inspired you to do something in your own home. The winners will be announced via Inspired Whims posting, Facebook, and Twitter on Monday, 24 Sep. So...please enter away all week, make sure to leave comments for each of your entries, and don't forget to check back in next Monday to see if you're one of our lucky winners! The pendant light post inspired me to think creatively when it comes to lighting in my kitchen. My fave post is the Budget Bedroom Makeover. congrats on one year girl! It takes dedication! I already like your blog on Facebook! 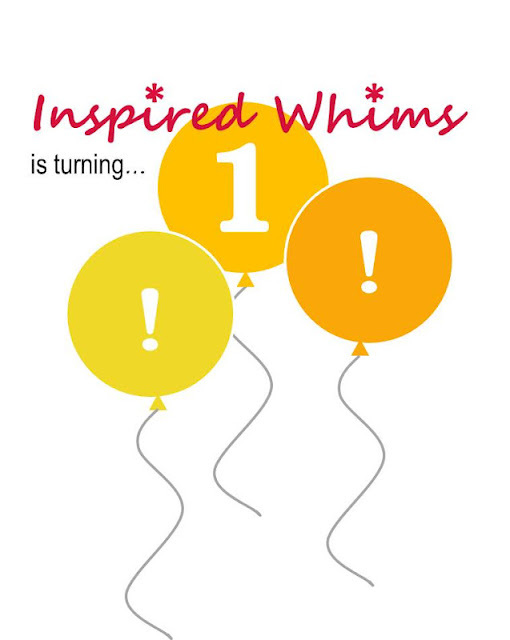 Happy Birthday to Inspired Whims! I always like your travel posts best! Happy blog birthday to you:)!! !